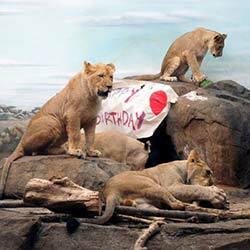 Lion cub siblings Njeri, Kiume and Hubert turned one on July 25! To celebrate this monumental occasion, zookeepers provided the feisty cubs with some extra special enrichment activities. Did you know lion cub dad, Themba, shared a birthday with his cubs? He turned nine on July 25! The cubs were given whole watermelons, paper mache balloons filled with nesting material, ice carvings filled with food juice and a huge block of multi-colored ice that resembled a birthday cake. Zookeepers also hung a “Happy Birthday” sign inside the exhibit. So, what appeared to be the cub’s favorite item? 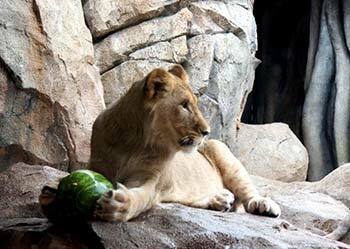 Sure, they enjoyed playing with the watermelons and the paper mache balloons, but the happy birthday sign, hung just above the cub’s indoor exhibit entrance, seemed to illicit the most curiosity of all! The cubs are healthy and growing fast. Sassy girl, Njeri, weighs 150 pounds, mama’s boy, Kiume, weighs 220 pounds and Hubert, the most personable of the three, weighs 210 pounds. Come see the lion cubs, and all our felines, at the Florence Mila Big Cat Country Exhibit, open daily.